Link removal can be a tedious process and common recommendations involve paying for several automation tools and the extortion costs of site owners, but it doesn’t have to be so complicated. I’ve detailed the process we’ve used many times with great success. Let’s start with the fun stuff and skip straight to the results. The process outlined in the rest of this post resulted in the successful removal of 53% of the referring domains from a terrible profile (removed 320 referring domains & 1397 links). This particular situation lent itself quite well to a case study as they were new to us and had a new website in development. There was no onsite work being done, and all we could work on was the link profile. It’s as close to a controlled environment as we’re going to find in the world of SEO. Make no mistake, this is a time-consuming process. However, after trying several tools designed to speed this process up, it’s pretty clear there is no substitute for manual revision when it comes to link removal. 1. Obtain as much of a comprehensive list of referring domains as possible. 2. Sort and bulk-categorise these domains as much as possible. 3. Manually review those borderline domains that can’t be easily sorted. 4. Scrape these domains for contact info. 5. Reach out to site owners and web masters asking for the link(s) to be removed. 6. Follow up on this request several weeks later. Make one final request for the remaining links to be removed. 7. Submit an updated disavow. To make this as easy as possible without sacrificing the result, I used a handful of tools to help out. If you’ve had success with something not on this list, I’d love to hear about it! Note that I focus on Referring Domains throughout this process. 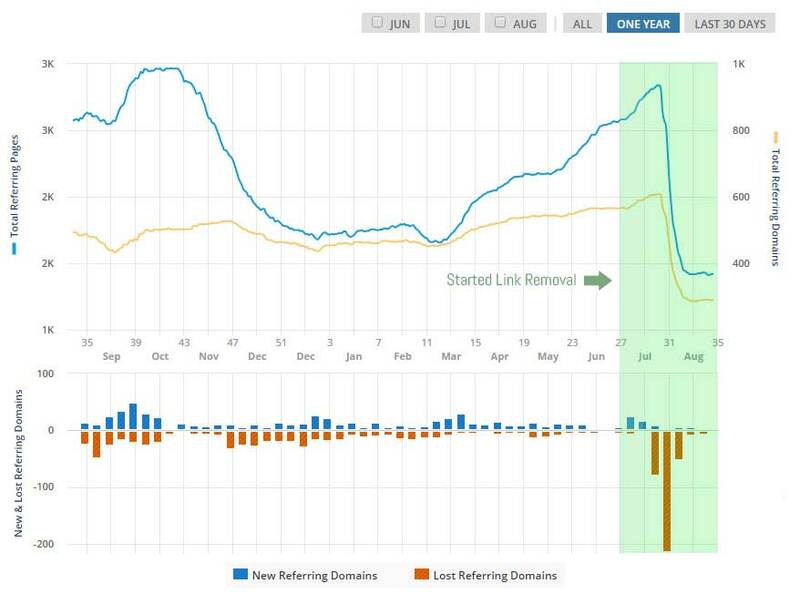 This is because when it comes to link removal, it’s typically going to be all or nothing – if a domain is bad we want all links removed. It’s also going to keep the volume far more manageable, often working with hundreds of referring domains rather than potentially tens of thousands of backlinks. Because no single link profile tool is perfect, I combine the data from both Ahrefs and Google Search Console (previously Webmaster Tools) to get a fairly accurate list of current referring domains. It’s by no means foolproof, but we’re playing a numbers game here so “almost perfect” is good enough.After exporting the list of referring domains from each of these tools, copy/paste all the referring domains into a single column in an Excel sheet and use Remove Duplicates to strip out the double-ups. This remaining list of domains is what we’re going to use as the “complete” list. 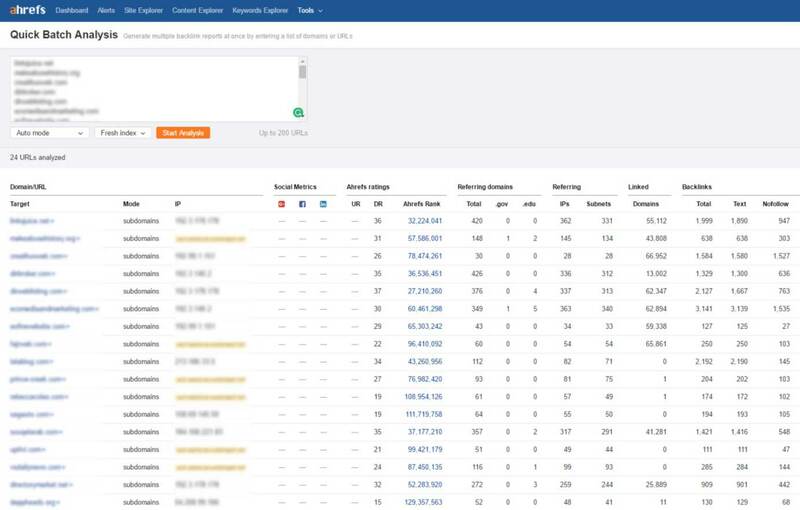 Because we now have a list of domains and only some of them have the Ahrefs strength metrics attached, the entire list is then pushed through their Batch Analysis tool (Tools > Batch Analysis). With this analysis done, we now have a complete list of referring domains and the relevant metrics. Time to export these to .CSV and get to work! With so much data for each of these referring domains it’s easy to get bogged down and over-analyse, so for this process I choose to work with only one tool in Domain Rank. Remove all but the Referring Domain and Domain Rating columns. Convert them to a table (Ctrl+T) and sort by Domain Rating from highest to lowest. This gives clear data that’s easy to read, and sorts the domains from roughly the most powerful to least powerful. After skimming through the list and seeing the spread of domain ratings, I made a judgement call on where I’d draw the line for each of the three broad categories each domain would be sorted into; Good, Bad, and Neutral. For easy visual reference, I marked each row with their matching Excel Style. In this case, I grabbed everything with a DR below 30 and marked it as Bad. Anything 31-50 was marked as Neutral and >51 as Good. Once again, it's not about being perfect. This at least gives me a good base to start from. To save time, filter the rows to show domains with red-flag words like "directory," "dir," "link," "seo," "black hat," etc are marked as “bad”. Also, skim the list looking for blocks of very similar domain names so they can be marked the same. Because we’re working with hundreds of domains here, checking every single domain is just not a good use of time. Starting with the “bad” group that are likely in need of removal, filter by cell colour and skim these from worst to best, checking for anything that may actually be a decent link. Anything that was of decent quality would be marked as “good” so it doesn’t get removed. An example of the type of low DR site that I would keep is a local provider website. There may be a real local business that’s relevant to the client who simply have a low DR because they only have a couple of backlinks of mediocre strength. Sure, they won’t be passing all that much strength but they are passing relevance signals and potential referral traffic. Time to work through the most time consuming part of this whole process - the mediocre middle ground. It takes longer because there tends to be a much higher ratio of decent sites that are in this category. Using a similar process, filter the rows to show only the yellow ones. This time around we’re looking to identify “good” or “bad” domains by their domain name where possible, and leaving the questionable ones in yellow for further investigation. By this point the “neutral” list will have been cut down to a manageable volume of questionable domains that can’t confidently be judged by domain name and DR alone. These will be left in yellow for now and dealt with soon. Now that we’re looking at the highest DR items in the list, this one is pretty quick to skim through. Taking the same process as the “neutral” domains, filter by colour to show only the green rows. There will likely be a handful of questionable domains in here, and some bad ones which should be marked accordingly. The rest should remain green since they appear to be strong, relevant domains. Tip: If you’re working with a larger profile, you may even want to include other columns that you can use to qualify domains. For example, you could sort by anchor text and mark all anchors referring to gambling, adult content, pharmaceuticals, etc as bad. With a fairly small number of questionable domains left in the “neutral” category, it’s time to work through these manually to sort the good from the bad. The only way to do this? Look at each of them in a browser. 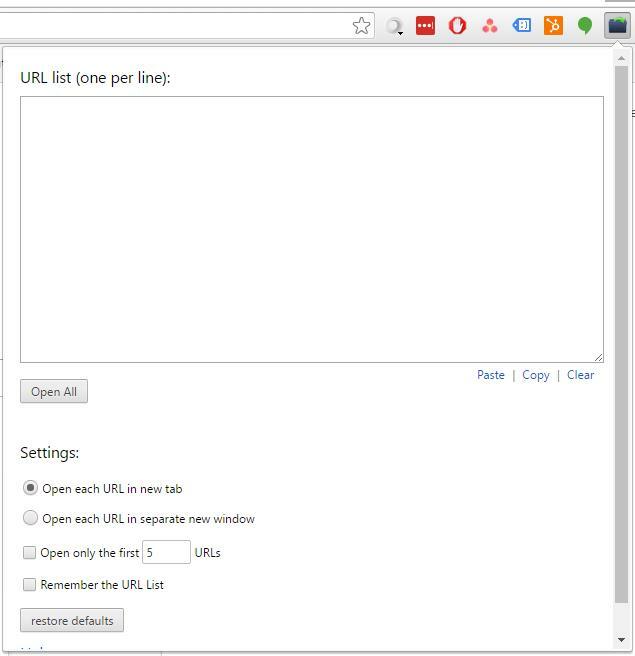 To save some more time, I do this in Google Chrome using the URL Opener browser extension shown below. With this extension you can paste a bunch of domains into the text box and select Open All to open each one in a separate tab. To keep from killing my PC’s resources, I grab about 10-15 at a time to open. After a few seconds, the tabs load and I quickly inspect each one. It usually takes no more than 2 seconds to identify a good or bad domain, and each one would be marked accordingly in Excel. What I’m really looking for here are real websites that are relevant to our client. Any of these are marked as good while the rest are marked as bad. I’ve now got the complete list of referring domains sorted. It’s time to start on the removal! With the list of bad domains ready to go, it’s time to start some outreach. This is where Buzzstream comes in very handy for a number of reasons. This is already quite a lengthy article so I won’t cover this in a whole lot of detail, but definitely recommend checking it out for yourself. Templated emails can include variables. You can start the email with Hi <<name>> and it will address the person by name for a more personal touch. Scraping of contact info. While not perfect, it can successfully scrape contact info from most domains. Clean management of link building and/or removal including notes, a “relationship stage”, email trail, and more so you can keep a handle on your outreach. Split testing response rates for your outreach templates. Identify exactly why templates are giving you the most success. My process for this which has proved successful time again might be very time consuming, but it is worth every second. Set up “relationship stage” labels so you can mark what point of the workflow each domain is in. Add the domains to Buzzstream and manually locate any contact details that couldn’t be scraped automatically (some may be contact forms). Write 2 or 3 different outreach emails that can be used for split testing and set them up. Reach out to all websites in the removal list and update the Relationship Stage for any that respond. After another 2 – 3 weeks send a final follow up (new templates again) request. Update the relationship stage again and submit a fresh disavow file. For easy management and more specific disavow notes at the end, I use the relationship stages below to identify exactly which stage of the process each domain is in at any given time. Some domains will be immediately disqualified for a couple of reasons, so it’s beneficial to cut these out of the outreach process and reduce the volume. It’s important to be aware that since we don’t pay for links to be removed, what we’re really asking for here is a site owner or webmaster to do us a favour by removing it for free.There aren’t really any strong value propositions to offer so the templates need to be written very tactfully. Below is an example of the one I’ve found the most success with but it is worth experimenting with various ideas to see what works for you. I’m currently working through the backlink profile for <<client name>> to bring it in line with Google guidelines. There are some links on your site (<<domain>>) that I would love to have removed when you have a moment. This is not a reflection on the quality of your website, we simply having to be very selective about the sites linking to them and make sure they’re very relevant to what we do. I’m happy to provide you with a list of the exact links and verification from our client that we’re acting on their behalf. I really appreciate any assistance you can offer here, please let me know if you need any further info and I’ll send it through. Whether or not you should spend the time on a link removal campaign is sure to spark heated debate well into the future, but results like this make it pretty clear to us and it’s a process we’ll continue to use for the foreseeable future. It’s not just about the early results we see, but it is also worth looking at the long term success. We want to “futureproof” as much as possible by complying with any guidelines, and staying true to the purpose of the tool: “First and foremost, we recommend that you remove as many spammy or low-quality links from the web as possible." 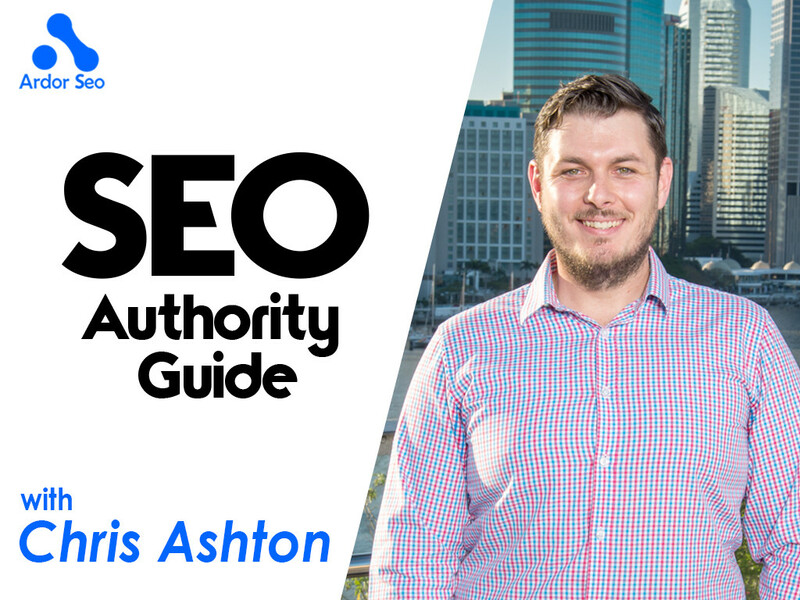 An established SEO expert, Chris has a wealth of technical knowledge and experience to share. Responsible for keeping the Kymodo team up to date on the latest industry info and best practice, he’s also an active and valuable contributor in many online mediums. 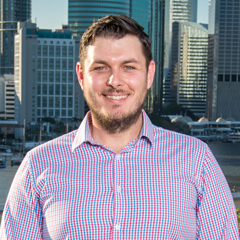 Keen whiskey enthusiast, motorcyclist and passionate digital marketer, he is eager to form an important part of Kymodo’s push to improve the SEO industry’s public image and demonstrate that it can deliver an exciting turning point for most businesses when done correctly.